Never give out personal information on the phone, through the mail, or over the Internet unless you have initiated the contact and you know who you are dealing with. Review your billing cycles on all bills. A missing credit card bill could signal that someone may have gained access to your account and changed the billing mailing address. Guard your outgoing mail by placing it in post office collection boxes or at your local post office. Add passwords to your credit card, bank and phone statements. Do not provide user names and passwords to anyone for any reason. Keep papers with personal information in a safe place. Shred your receipts, copies of credit applications, physician statements, insurance forms, bank checks and statements you are discarding, expired charge cards and credit offers you receive in the mail. Many communities have a “Shred Day”. Keep all personal information in your home in a secure place not easily discovered by others. Verify who has your personal information at your place of employment and verify that these records are kept in a secure location. Maintain an accurate record of all credit cards that you carry with you. Include in the record the names on the credit cards, account number, expiration date and phone number to call in case the credit card is lost or stolen. If your credit cards are lost or stolen call the company as soon as you realize the credit card is not in your possession. Cancel the credit card immediately. Do not carry your social security card with you. Give your social security number only when it is absolutely necessary. Use another identier when possible. Check your credit report at least once a year to make sure it is accurate and includes only activities you have authorized. Beware of text messages received on your cell phone telling you to use your computer to access the web address given in the text message. These messages may tell you that unless you comply you will be charged or subscribed to a service. Once you use your computer to go to the web address given, your computer may be compromised with a Trojan Horse program and your data security may be at risk. A typical lottery scam begins with an unexpected e-mail notication that you have won a large sum of money in a lottery. The email is often originating from a free e-mail account such as Yahoo, Hotmail, MSN, etc. Scammers will often use the names of legitimate lottery organizations, thereby trying to make themselves look legitimate. You are usually told to keep the notice secret and to contact a claims agent to validate. After contacting the "agent" you are asked to pay a processing fee or transfer charge so the winnings can be distributed. Of course, you never hear from them again. 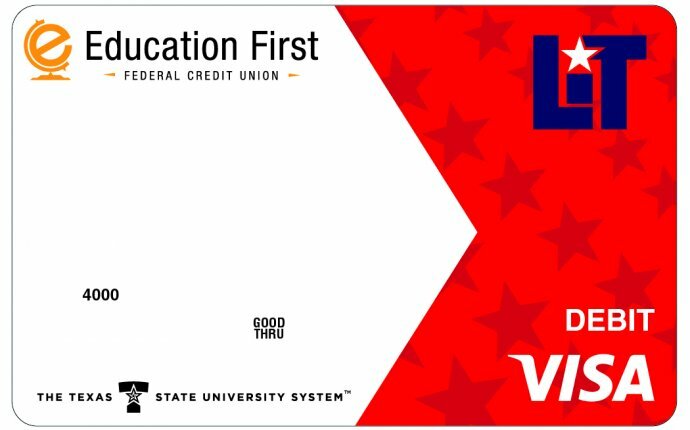 Give us a call at 409.898.3770, Monday to Friday from 8:00 a.m. to 6:00 p.m. to report a lost or stolen Education First debit or credit card. Internet purchases have increased signicantly over the past several years. You can buy just about anything on the Internet with a credit or debit card. Purchasing on the Internet is convenient; however, care must be taken when using a credit or debit card to purchase goods and services on the Internet. Learn as much as possible about the products and seller. Read and understand the retailers’ return and refund policy. Choose a secure password to protect your account information. Include upper case, lower case, a special character and a number in your password, if possible. Only order from retailers that offer a secure checkout and payment process. Select a User ID, Passcode, and Security Questions that are difcult to guess, but easy for you to remember. Avoid using family member names, local sports names, birth dates, anniversaries, addresses or phone numbers. Do not share your Internet Banking User ID or Passcode with anyone. Never use information that could be readily found in your wallet or purse, such as your house number or date of birth. Memorize your Internet Banking User ID or Passcode instead of writing it down. Internet Banking is a good way for you to monitor your accounts. You have direct access to your accounts and transactions 24 hours a day with any Internet connection. Never provide your nancial information to an unfamiliar website. Don't leave your computer during an Internet Banking session. Always "sign-off" of Internet Banking when you complete a session or leave your computer. Review monthly nancial statements promptly and report any discrepancies immediately. Never ignore suspicious charges on your statements. If doubtful or unauthorized charges appear on your bills or statements, call immediately to resolve the discrepancy. Shred unnecessary nancial documents, including old bank statements, invoices, and unwanted pre-approved credit offers.